Tina is a “connector” in the Pittsburgh disability community. Her work as a writer and speaker expands public understanding of disability, highlights people and organizations that are creating opportunity and positive change, and links individuals and families to resources. Her popular newspaper column, “Breaking Down Barriers,” which ran for 12 years in the Pittsburgh Post-Gazette, has been recognized for increasing awareness of issues and providing a voice for the disability community. Her feature articles and first-person pieces appear in the Pittsburgh Post-Gazette, Philadelphia Inquirer and other publications. Tina’s work is inspired by the remarkable people in the disability community who have shared their stories, perspectives and journeys with her. She counts her son, Mark Steidl, age 23, among her most influential teachers. 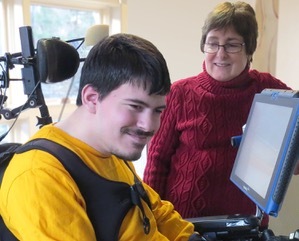 Mark was diagnosed with cerebral palsy as an infant. “A Whole New World” (essay, Pittsburgh Post-Gazette, 1996), chronicled the family’s adjustment to Mark’s medical and developmental needs during his first year. Seventeen years later, “A Look Back at a Whole New World” (essay, Pittsburgh Post-Gazette, 2013) reflected upon Mark’s high school graduation and transition to young adulthood. These two essays and other published work are frequently used to educate families, college students, professionals, and the community. Mark is a graduate of the Pittsburgh Public Schools and a current student at Community College of Allegheny County, where he is majoring in social work foundations. He serves on the youth caucus of the National Council on Independent Living, advocates in the United Way’s 21 and Able and #IWantToWork campaign, and is proud member of the LGBT community. Tina holds a master’s degree in education from Wright State University and a master’s in creative writing from the University of Pittsburgh. She is active in the Western Pennsylvania community, serving on several boards and committees, and has served as adjunct faculty at the University of Pittsburgh and Chatham University. As a writer and editor, Tina has worked for more than 30 non-profit agencies in the areas of disability services, healthcare, education, community development and the arts. As a disability rights advocate, she has helped lead major community-serving projects, including the Allegheny County Family Resource Guide for Families of Children with Special Healthcare Needs and Disabilities and the Pittsburgh/Allegheny County Celebration of the 25th Anniversary of the Americans with Disabilities Act. The ADA 25th Anniversary observance won an Award of Merit for from the Public Relations Society of America-Pittsburgh chapter. Tina and her husband, David Steidl, live in Pittsburgh with their son Mark. Mark’s older brother, Paul, lives in San Francisco.